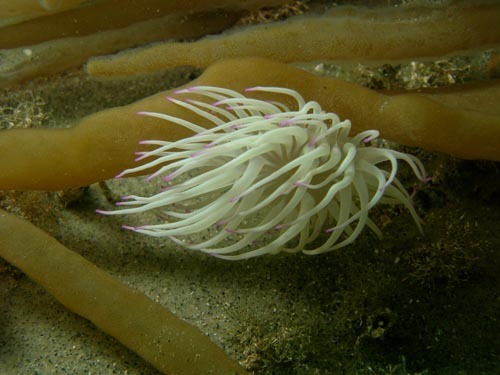 Description of life under the water including information on crabs, anemones, sponges and sea squirts. Beneath the waters of Chichester Harbour there are slippers, spiders and peacocks (limpets, crabs and worms), dahlias, carrots and gooseberries (anemones, sponges and sea squirts)! Underwater, the Harbour is crowded with life. Pontoon pilings and mooring chains are covered in a wealth of colourful seaweeds and animals, and reefs of native oysters provide a home for bright red sea squirts, hydroids and sponges. The worms, crustaceans and molluscs that provide food for Harbour birds also sustain a rich food chain below the waves. The shallow waters teem with plankton and are an important nursery area for young fish. The mud of the Harbour floor is quite inhospitable, but pebbles and shells provide a hard surface for marine plants and animals to anchor to. There is a very unusual plant that manages to survive in the mud. Eelgrass (Zostera) is not seaweed, but a flowering plant. The patches, or 'beds', are unique in Sussex, and significant nationally, and provide a sheltered nursery for juvenile fish, crabs and other species. In the muddy seabed, most life is anchored in, burrowed in or crawling around within the sediment. Worms do well here; including the Peacock worms that hide their bodies in tubes made from mud and mucus. 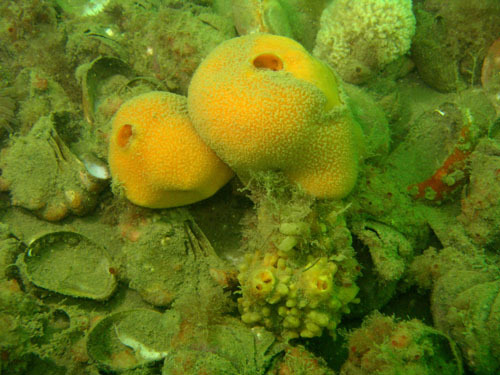 Sea squirts are living sieves that form encrusting colonies on pebbles and cobbles, sucking water in, filtering the edible bits and ejecting the water. In shallower areas you will find sponges growing on boulders. Apart from minute single-celled organisms (like amoebas), sponges are the simplest members of the animal kingdom. Slipper limpets were accidentally introduced in the late 19th Century, and completely alter the seabed habitat, providing hard surfaces to plants and animals to attach to. Alien-looking cuttlefish are abundant in the summer months, hunting and nesting among the weeds and eelgrass. Crabs, like the Spider, Hermit and Shore crabs, are like armour-wearing underwater insects. The Hermit crab does not have it's own armour, so it borrows discarded mollusc shells instead. As the crab grows it needs to find a new home and will carry out a thorough inspection before moving in. The sheltered Harbour supports large and diverse populations of fish (over 40 species altogether). Several commercial species use the Harbour as a nursery area, including Bass, Bream, Mullet, Sole and Plaice. You can also find colourful Corkwing wrasse. Pipefish are found among algal cover in sheltered areas, and like their close relatives the Seahorse, it is the male who gives birth to the young. The Harbour also has its share of large predators, including Harbour seals, Grey seals, and Smoothounds, which belong to the Hound Shark family. Cockles are molluscs that have a hard outer shell and a soft creature inside. They grow to about 5 cm and have a double shell held together by a hinge. They live buried in clean sand on the seashore just under the surface. At low tide they clamp their shells shut and hide in the sand from birds such as gulls and oystercatchers, which are good at breaking into their shells. They are also eaten by starfish and flatfish. People also like to gather and eat cockles. Cockles feed by drawing water through a tube called a siphon when the tide is in. They strain out small creatures to eat and then expel the water through a second siphon. They have to live near the surface of the mud because their siphon is short. They release both eggs and sperm into the water and the developing larvae float among the plankton. When they are bigger they settle on the seabed. Crabs live in the sea and can often be found on the seashore, hiding in rock pools and among seaweed. They have a soft body covered by a hard shell which is usually green- brown. They grow to about 9 cm and they have 10 legs. 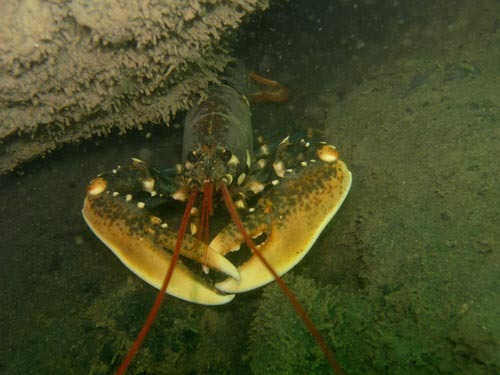 The front two legs are claws, which they use to catch food and fight with. Camouflage colouring and a hard shell help to protect crabs from wading birds that like to eat them. Crabs run sideways, which confuses anything trying to catch them! Crabs use their claws to catch and eat food. They like to eat meat and will eat almost anything alive or dead! Catching crabs on the end of a line with a piece of bacon has been a favourite children’s pastime for many generations. A crab grows by shedding its shell, exposing a new soft one underneath. This takes in water, expands and then hardens. The white ‘dead’ crabs that you find on the seashore are not dead but just the old shell that has been left behind. The eggs are carried in a flap on the underneath of the female and then released into the water where they float as part of the plankton. After about 3 months they sink to the sea bed as tiny crabs. Many people find white, oval cuttlebones on the seashore. However not many people have seen a live cuttlefish. A cuttlefish is related to an octopus. The cuttlebone that you sometimes find is inside the cuttlefish and is covered by the flesh of the creature. The bone is light and porous and the cuttlefish can fill it with water to make it sink to the seabed so it can hide in the sand. When the cuttlefish empties the bone of water it can float and swim. A cuttlefish is oval, up to 40 cm long and is covered in a zebra stripe pattern, which helps to camouflage it among the eelgrass and seaweed. Its body is surrounded by fins like a skirt, which undulate to help it swim. If it is attacked it can produce a cloud of ink in which to hide. It has large eyes and it can change colour by opening and closing colour cells in its skin, which helps to camouflage it and confuses its prey. It has a tough mouth like a beak to eat crustaceans, especially crabs. It has 10 tentacles around its mouth. Two of these are long with suckers on the end, which it can shoot out to catch prey. It likes to live among eelgrass and seaweed on a sandy or muddy shore so that it can bury itself in the sand or hide in the eelgrass to wait for prey. It can move fast by sucking in water and shooting it out of a funnel that propels it forwards. It lays clumps of black eggs called ‘sea raisins’ or ‘sea grapes’. They are attached to eelgrass or seaweed. Freshwater shrimps are very common small creatures that live in streams and ponds. Their bodies are flattened and curved with lots of legs. They swim on their sides using their legs. They grow up to 2.5 cm long and are a translucent pale brown colour. They live on the bottom of the pond or stream and among the plants. They eat small bits of plants and dead material and in doing so help to keep the water clean. They locate food by using their long antennae. The male is larger than the female and they breed very successfully. The female holds the eggs in a brood pouch under her body and the eggs hatch into miniature adults not larvae. Lugworms are reddish brown worms that live on sandy or muddy shores. They grow up to 20 cm long and live in the bottom of a U shaped burrow. They line the walls of their burrows with sticky mucus to stop them collapsing and keep a current of water moving through to provide oxygen. There can be thousands of lugworms in a beach and they hide in their burrows away from wading birds such as redshank, which like to eat them. Fishermen also like to dig them up to use as bait to catch fish. They eat the sand and mud that falls into the top of their burrow and digest the small pieces of plant and other food in it. The waste sand and mud forms worm casts on the beach that we sometimes call ‘sand spaghetti’. Many lugworms spawn together into the sea at the same time in October and the larvae stay near the seabed where they develop into adults. Periwinkles are small, dark coloured snails that live on the seashore. They have a rounded spiral shell and are up to 3 cm high. They are very common even though they have been collected for centuries by people to be cooked and eaten. Their tough shell protects the soft snail inside from being damaged by crashing waves. Their shell also helps protect them from hungry wading birds although there are several birds that are able to crack the shell and eat them. At low tide they are in danger of drying out so they keep moisture in by closing the entrance of their shell with a horny plate called an operculum, like we would close the door of our house to keep the bad weather out. They can also stick themselves to rocks with a film of mucus. When the tide is in, they feed by scraping seaweed from rocks or eating dead plants. They are able to live in polluted water near sewage works and in marinas. 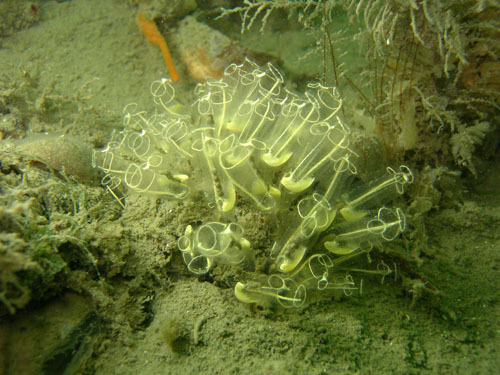 After mating, the female releases a capsule containing about 9 eggs which hatch and float in the sea. They form part of the plankton before dropping to the seabed and then crawling to the shore. There are about 23 Common or Harbour seals living in the Harbour. They are mottled grey and brown in colour and the males are about 1.7m long, the females are smaller. There are also Grey seals sighted from time to time. Seals swim by moving their back flippers from side to side. They have whiskers that they use to feel their way around the seabed if the water is cloudy. They like to bask on sand or mud banks near the high water line when the tide is out, where they can easily be mistaken for rocks! They keep a look out for danger and if they feel threatened they will take to the water. At high tide they hunt for fish in the water. They dive to the seabed to find flat fish such as flounders and other bottom dwelling fish. In between dives they can sometimes be seen bobbing in the water with just their heads showing. They are becoming less shy of people and they have even been seen in the marina where they have been known to bask on the deck of a boat! Seals mate at sea in the autumn. One pup is born in June or July on an exposed rock or sandbank. The pup can swim almost immediately and can suckle milk from its mother on land or in the water. Learn more about the seals in the Harbour on the Seals page. Ragworms are brown worms that live in the mud and grow to about 12 cm long. They are able to swim or crawl through the mud using bristles, which look like legs. They hide in the mud from birds such as curlews that catch and eat them by probing the mud with their long beaks. Fishermen also like to dig them up and use them as bait to catch fish. They live in salt water where it is muddy or sandy. They are active hunters, crawling through the sand and mud to catch and eat small creatures by shooting out their strong jaws. Many ragworms release sperm and eggs together whilst swimming in the water. The fertilised eggs develop into very small larvae and then drop to the bottom and grow there. Sticklebacks are small fish up to 10 cm long with a long thin body and spines along their backs. The nine spined stickleback has nine spines along its back but also one on each fin and one under its tail. The colour of the fish varies but is generally olive green or grey above and bronze or silver below. The spines are not very long so they are not much protection from other fish and birds. However, their colour helps to camouflage them when they hide among the water plants. Sticklebacks usually live in ponds or slow moving freshwater streams but they can also be found in estuaries where the water is salty. They eat other creatures in the stream such as mayfly larvae, worms and freshwater shrimps. In spring the male stickleback changes colour and becomes marbled grey-green above and black below with white spines. Most fish release eggs and sperm into the water and then do nothing more to care for their young. However the male stickleback builds a nest of plant material stuck together with sticky mucus. He attracts females to lay their eggs in the nest and he fertilises them. When the nest is full, he looks after the eggs and attacks anything that would harm them. He also takes care of the young fish when they hatch.